Canadian Prime Minister Justin Trudeau is trying to convince President Trump of NAFTA's merits as a new round of renegotiations began on Wednesday near Washington. WASHINGTON -- U.S. President Donald Trump said on Wednesday he would be open to doing a bilateral trade deal with Canada but not Mexico if talks between the three countries over the North American Free Trade Agreement fall apart. Asked by a reporter if he would make a trade pact with Canada if he cannot reach agreement with Mexico in the NAFTA negotiations, Trump said: "Oh sure, absolutely. It's possible we won't be able to reach a deal with one or the other, but in the meantime we'll make a deal with one." 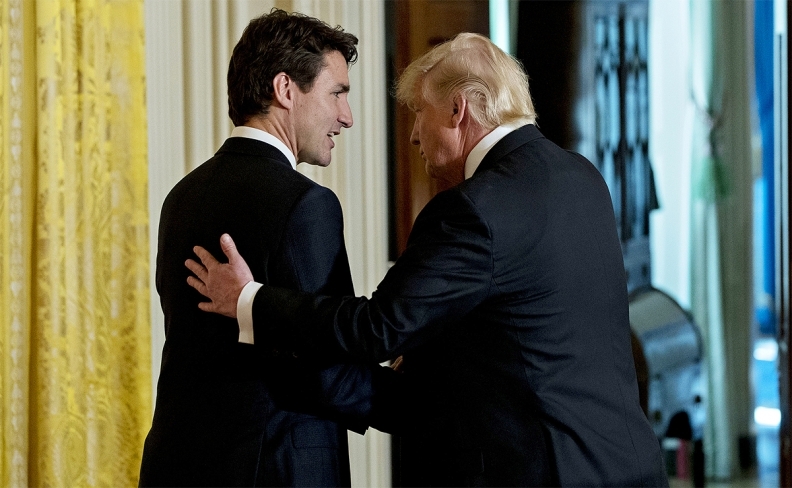 Trump was speaking in the Oval Office beside Canadian Prime Minister Justin Trudeau, who is trying to convince the U.S. president of NAFTA's merits as a new round of renegotiations began on Wednesday near Washington. The U.S. Chamber of Commerce on Tuesday accused Trump's administration of trying to sabotage the talks with "poison pill proposals", including demands for more favorable treatment for the U.S. side on car production, and a "sunset clause" to force regular negotiations. Asked during his appearance with Trudeau whether NAFTA was dead, Trump said, "We'll see what happens." People briefed on U.S. proposals to be presented this week said Washington is seeking to sharply lift North American content threshold in car manufacturing. The proposals call for North American content overall to rise to 85 per cent from the current 62.5 per cent. In addition, the United States wants to add a new 50-per cent U.S.-specific content requirement, something that was not in the earlier agreements. The U.S. side sees strengthening the rules of origin for the auto industry as a way to bring back automotive production and jobs from Asia. Mexico strongly opposes such a move, which would damage its own car industry. In his meeting with Trump, Trudeau was expected to remind the president that Canada is the United States' biggest export customer, with largely balanced two-way goods and services trade, and is not the cause of U.S. manufacturing jobs lost under NAFTA, Canadian officials said. "In terms of trade, the U.S. sells more to Canada than it does to China, Japan and the United Kingdom combined. So we are your biggest customer,” Trudeau told members of the U.S. House of Representatives Ways and Means Committee on Wednesday. “There will always be challenges that come up that we can thoughtfully work through," he told the lawmakers. Other contentious U.S. proposals opposed by Canada, Mexico and U.S. business interests include the five-year sunset provision, radical changes to NAFTA's dispute arbitration systems, changes to intellectual property provisions and new protections for U.S. seasonal produce growers. U.S. Trade Representative Robert Lighthizer said on Wednesday the three nations have completed their negotiations on company competition policy, reaching agreement on a chapter that goes beyond previous U.S. trade deals to ensure "certain rights and transparency under each nation's competition laws." Corporate advisers were largely being left in the dark as the fourth round of negotiations kicked off. It was unclear why, but the office of the U.S. Trade Representative has not scheduled a briefing for those advisers, many of them lobbyists for large companies and trade associations, until Sunday. In prior rounds of NAFTA talks, the advisers received daily briefings. First Shift: Can U.S. avert a NAFTA deal-breaker?